This is a larger version of our Mini BBQ Tongs – 2 Forks. 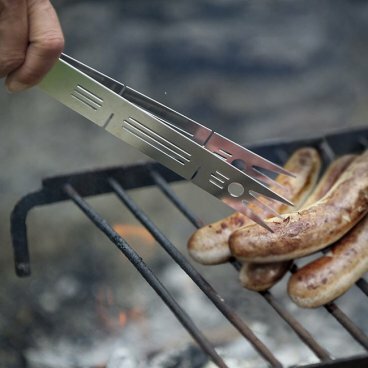 Again, what makes the Large BBQ Tongs – 2 Forks so special is the amazingly simple construction. They are easily plugged together to make tongs in the field, and when separated, you have two forks. When taken apart they save space in your backpack, and they can also be plugged together in the middle to construct a trivet. That makes them ideal for all your bushcraft and camping needs. Sometimes it‘s just great to save space and weight. Moreover these are tongs and two large forks. 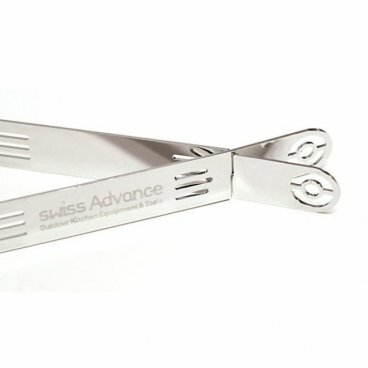 The forked tongs are also great for serving salad. The fields of applications are plenty. The slot in the front can be used for more bending if needed. Each fork measures 9-13/16” long by 1” wide.